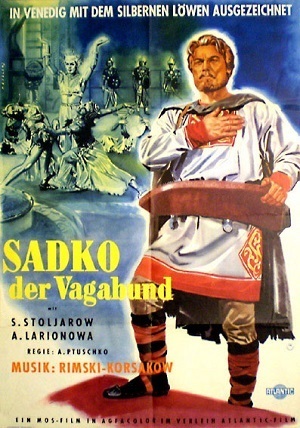 A Soviet film that centers on the Russian hero Sadko and his attempts to bring happiness to the inhabitants of Novgorod (called Copasand in the English dub), employing a number of elements from the original Sadko mythos, such as a wager with wealthy merchants to catch a golden fish from the sea. Sadko, aka Sinbad, arrives in his home city Novgorod/Copasand to find a vast social gap between the wealthy merchants of the city and the lower-class citizens. In an attempt to even the playing field and bring happiness to the people, Sinbadko makes a bet with the merchants that, if he can catch a golden fish from the sea, they will give him the keys to their storehouses. He catches his fish with the help of Magical Girl the Ilmen Princess (Morgyana in English), the Daughter Of Neptune (aka the Sea Tsar), gets the merchants' loot, and promptly gives it all away. In the midst of all this, Sinbadko develops (mostly offscreen) a relationship with a Scandarabian girl by the name of Lyubava (or, Luberia). However, the party comes to a quick stop once the money is all gone. And so Sinbadko endeavors to search the world for a so-called "Bluebird of Happiness" which will bring permanent joy to his people. All out of money, he needs help again from Morgyana, but with a fresh catch of golden fish he is soon able to build boats and hire a loyal crew, and they're off on a series of episodish mini-adventures. The quest eventually brings them to India, where a Jamie Farr-ish prince holds in his possession a reputedly magical bird. Prince Farr challenges our heroes to a game of chess with the bird as a prize, and naturally Sinbadko wins. But the prince is a sore loser and locks them all inside the vault with the bird. The bird, for its part, is not a "Bluebird Of Happiness" but rather a "Phoenix Of Ennui" (or something) which sings only of sleep with a remarkably hypnotic voice. Sinbadko is disappointed but takes the bird with him anyway, using its hypnotic song to escape the Indian armies. On the voyage back home, the fleet is beset by a violent storm, and Sinbadko sacrifices himself to the sea for the sake of his crew (not that it helps). Sinbadko sinks to the bottom of the ocean and is adopted into the family of Neptune, God of the Sea, who wishes Sinbadko to stay and entertain him, even offering to marry the mortal to one of his daughters in order to tie him to the undersea kingdom. Of course, Sinbadko chooses as his new wife his old pal Morgyana, who gives him leave to return to his own world. And joy of joys, just as Sinbadko makes his, er, not-so-triumphal return to his home, so also arrives his crew, having ultimately weathered the stormy seas. Alas, Sinbadko has no "Bluebird Of Happiness" to give to his people, but he does have An Aesop: "Follow your hearts to happiness!" The original Russian version was directed by Alexander Ptushko, whose other credits include Ilya Muromets (AKA The Sword and the Dragon) and Sampo (AKA The Day the Earth Froze). Francis Ford Coppola was involved in the English adaptation of the script for Roger Corman. Artistic License  Economics: In-Universe example. Redistributing wealth with no real plan ultimately destroys the town's economy and achieves nothing, although they seem to recover remarkably quickly. The Big Guy: Vyshata, who is something of a Gentle Giant, acts as the muscle for Sadko's voyage. Bluebird of Happiness: The MacGuffin. Boring Invincible Hero: Even if Sinbadko has to have the help of a sea goddess. Bowdlerisation: It can be argued that the Dub Name Change was made so that American audiences of The '50s wouldn't have to watch a Russian movie with a Russian hero. However, the bowdlerisation meant that various plot and character threads were rendered nonsensical; for example, Sadko is a minstrel, so it makes sense that the Sea Tsar would know him by reputation and thus want to hear him perform, but Sinbad is a seafaring adventurer, so Neptune's request for a performance from him seems to come out of nowhere. Despite that, the film's glaring Russian influence can be seen in the main Copasand set which appears to have a huge Russian Orthodox church in every other shot (which you can tell because of the three-beamed cross on its spires. Breaking the Fourth Wall: Sinbadko looks directly at the audience to deliver the moral of the film in the final shot ("Happiness is here!" in the original Russian, "Search your hearts for happiness!" in English). Brown Note: The Phoenix's hypnotic song. Crossover Cosmology: The American dub gives us the "Arabian" hero Sinbad, meeting up with Roman sea god Neptune. Disney Death: We see Sinbadko's crew wiped out in the storm, but they later return unharmed. Dub Name Change: Sadko to Sinbad most notably, but also Lyubava to Luberia, Novgorod to Copasand, the Ilmen Princess to Morgyana, the Sea Tsar to Neptune, and so on. For the Evulz: The Vikings/Mongols: "Happiness is to kill our foes!" I Just Want My Beloved to Be Happy: Sea goddess Morgyana is in love with Sinbadko, but allows him to return to the surface world and Luberia. It Was with You All Along: The Aesop. Possibly a concession to Soviet policy of the time; in the epic poems on which the film is based, Sadko goes on a journey to make his fortune, not to find a bird of happiness. Magical Girl: Morgyana, the daughter of Neptune the Sea God (in the original version, she is simply referred to as the Lake Ilmen Princess, and her father is the Sea Tsar). McGuffin: The Bluebird Of Happiness. Sinbadko and his crew never actually find it (concluding instead that their real happiness was back home in NovCopagorand), but their search for it is what drives the plot of the film. Narrator: In the English dub only; the original Russian version has no narration. Public Domain Soundtrack: Much of the score for the film is taken from the works of Rimsky-Korsakov, who composed a symphonic poem and an opera based on the Sadko myth (for example, the prelude from the opera - itself recycled from the opening of the symphonic poem - plays over the opening credits of the film). Stop Trick: A common device for effects shots. For example, Trifon proves to Sadko that despite his age, his skills as a trickster may be helpful to his quest by blowing on an egg and turning it into a bird; the effect is undermined by the obvious use of a stop trick. Stupid Sacrifice: Sinbadko jumps overboard during a storm to appease Neptune, so that his crew will be spared. They're not, but it's ultimately subverted; see Disney Death. Tagalong Kid: The boy Ivashka, first seen performing at the merchant's feast with his grandfather Trifon, is the first person to ask Sinbadko to take him on his journey.